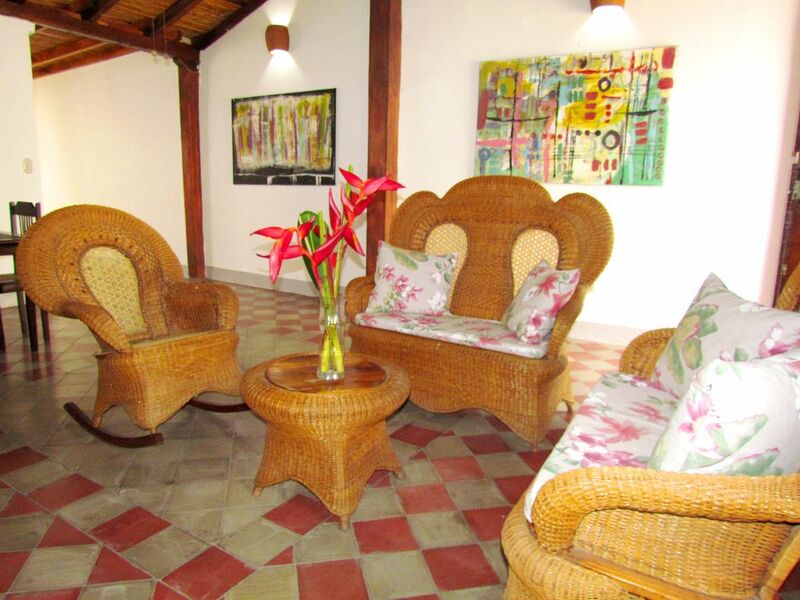 Casa Bohemia is located only a few blocks from the center of town in one direction and Lake Nicaragua in the other. It is situated across from the beautiful Guadalupe church where you will have front and center seats to the colorful processions for all religious holidays. Although the neighborhood can sometimes be quite lively, Casa Bohemia is a quiet place to relax and enjoy Granada. Upon entering the house, you will find a comfortable living/dining area. The art on the walls are from local artists and the furnishings are handmade. The fully equipped kitchen has abundant cabinet space and work areas so that you can prepare all your meals with ease. Having an open air patio is one of the wonderful things about colonial living. The tranquil sound of water from the tiered water fountain is heard throughout the home. Downstairs there is a large bedroom with twin beds, ceiling fan and air conditioning. There is a full bath with a beautiful natural stone shower as well as a laundry room. Upstairs you will find the master bedroom with a queen bed, full bath and air conditioning. The upstairs balcony provides you with a great view of the spires of the Guadalupe church. Although there is no pool in Casa Bohemia, less than one block away is the Hotel Granada, the largest saltwater pool in the area. Hotel Granada offers day passes to the pool area where you can also enjoy drinks and food around the pool.